CrossOver for Mac can run Windows apps on Intel Macs without Windows installed. Adding new Windows software is easy. Just place your install CD in your Intel Mac, and CrossOver for Mac will recognize it and offer to begin the installation process. 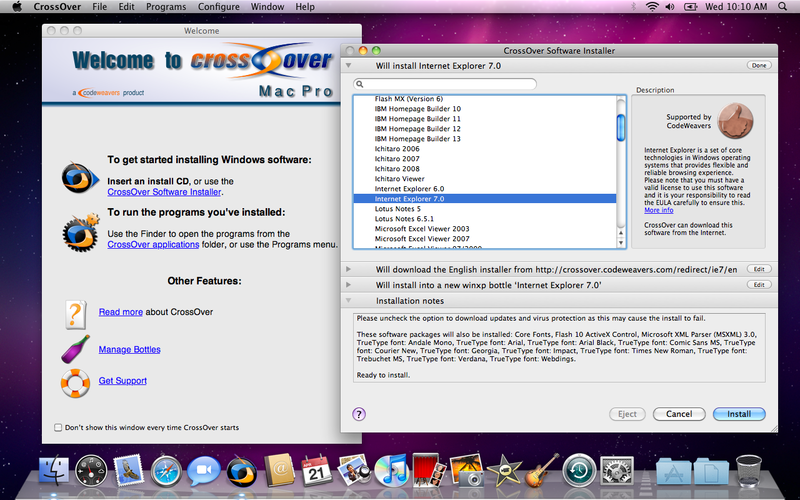 CrossOver for Mac then completes the installation and configures your application to run on your Mac. That's all there is to it. We've created two versions of CrossOver for Mac 'Standard and Professional' to serve our home-user/enthusiast and corporate markets even better. CrossOver for Mac Standard provides individual users with the ability to run a wide variety of Windows software cleanly and economically. CrossOver for Mac Professional provides corporate users with the enhanced deployability and manageability features their environments demand. And purchasing a license for Pro also lets you play your favorite games with its included license for CrossOver Games. Qweas is providing links to CrossOver for Mac 10.2 as a courtesy, and makes no representations regarding CrossOver for Mac or any other applications or any information related thereto. Any questions, complaints or claims regarding this application CrossOver for Mac 10.2 must be directed to the appropriate software vendor. You may click the publisher link of CrossOver for Mac on the top of this page to get more details about the vendor.